Deva Insignia 1/4 Turn Taps Bath (2 Pack) is rated 5.0 out of 5 by 10. Rated 5 out of 5 by ColinPS from Great value for money and British Made Perfect product and well made. Rated 5 out of 5 by GS Rider from Good value Bought for an elderly customer who struggles with grip and these were a good choice for her. They felt decent quality to install and customer was happy with the look and how easy lever are. Rated 5 out of 5 by Farweasel from First impression is they're well made & look good Existing bath tap failed beyond repair. So I wanted a low cost tap that looked like a high cost tap set. These exceeded expectations ........... In fact I'm so impressed I ordered 2 pairs of basin taps. (One for the bathroom sink to match the bath, the other for an en suite I plan to build). Rated 5 out of 5 by Smart Mart from Very nice taps with 1/4 turn ceramic discs Just installed look very nice as a pair of basin and bath taps together, certainly makes my bathroom look a bit more modern now. Rated 5 out of 5 by mudhut from Excellent value These taps look great and are sold here at a good price, some £50 less than the maker's "list" price. Tap has nicely engraved H & C on the caps using ceramic 1/4 turn cartridges. The body has no seal to the base trims and may benefit from a lick of clear silicone sealant during fitting. Base trims have rubber seal insert below. Plastic back nuts are absolutely fine, fit the normal tools (don't buy/use one of those very cheap cast, blue-painted pieces of junk) and won't corrode of course. Rubber washer for underneath also supplied which will help prevent rotation of tap body. Smooth on/off action but the tap design means the flow from the nozzle was not at all stable at even the low flow rates I'm stuck with. This makes the tap a little "splashy" which is not altogether surprising as the narrow spout is not swept but makes an abrupt change of angle. Centre of pillar to centre of nozzle is approx 80mm and the flow is projected forwards at an angle so no problem easily clearing the edge of the basin. Tool station does not give this dimension. Also available, but oddly not from here, are bath mixers, monos and others. Rated 5 out of 5 by SieN from Great taps These taps look the part and seem well made the water comes on like a sprinkler not like a normal boring tap :) I'm happy with them. Rated 5 out of 5 by Anonymous from Simple, straightforward taps that work smoothly. 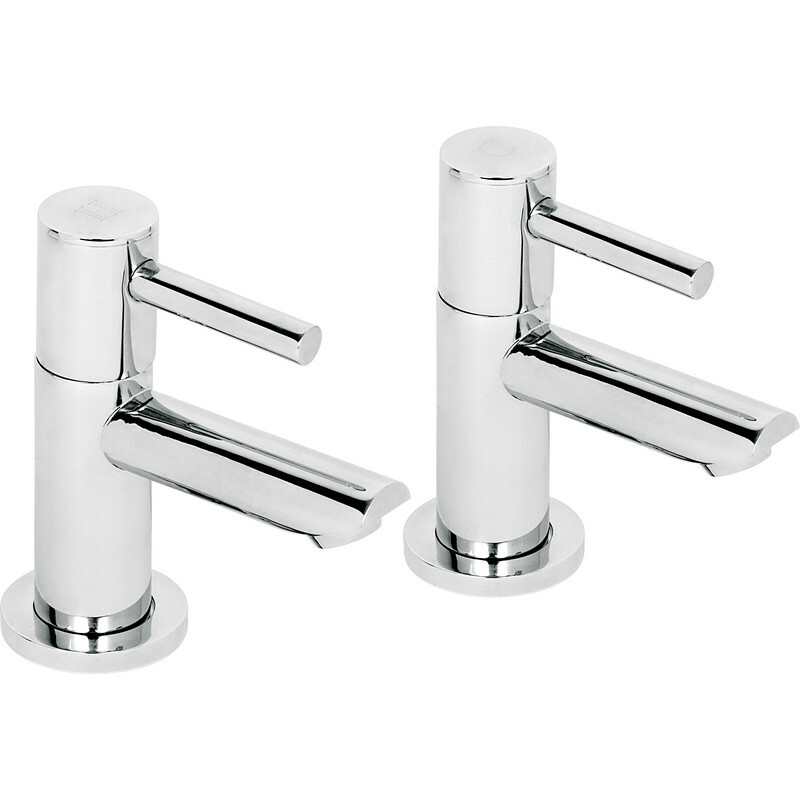 Liked these so much after fitting in the bathroom that I bought a second set to update our en-suite washbasin. At the price they're hard to beat.